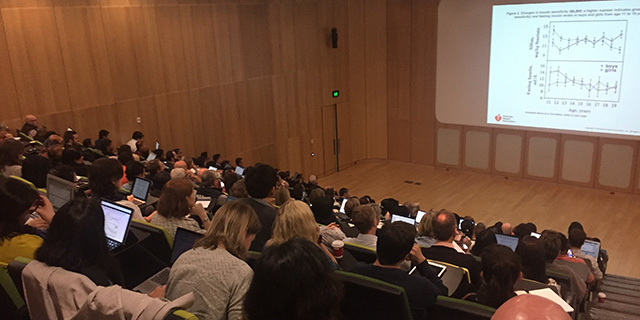 On 3 and 4 June 2017, the annual Melbourne Children’s Clinical Paediatric Update was held at the Royal Children’s Hospital, Melbourne. The event was sold out, with more than 200 attendees, who came from all states across Australia, as well as New Zealand. The majority of attendees were general paediatricians but the event was also attended by paediatric trainees and other medical practitioners. A total of twenty-nine expert speakers, all from Melbourne Children’s Campus, provided updates on a range of child and adolescent health topics. An optional Master Series session, covering paediatric developmental medicine topics, was held on the Sunday afternoon. An exciting development this year was the use of a phone app, for attendees to access the program, presenter biographies and presentation slides, and to provide feedback about the Update. This was well received and will be further developed in future years. Overall, the Melbourne Children’s Clinical Paediatric Update was a great success and we look forward to future Updates in years to come!